The Terrorism and Social Media Conference (TASM) was held on 27 to 28 June in Swansea University. The event kicked off with a keynote speech by Prof. Bruce Hoffman from Georgetown University entitled “The Threat From ISIS and al Qaeda: Contextualising the Role of Social Media” in which he emphasised that social media has played a serious role in fostering terrorism. VOX-Pol Coordinator Prof. Maura Conway of Dublin City University presented her keynote speech entitled “Researching Violent Extremism and Terrorism Online: Challenges and Directions” in which she examined the latest trends and threats facing violent extremism and online terrorism researchers. She called for renewed research focus on social media “visuals”–including still images and videos. Prof. Conway also voiced her concern about the severe effects the daily consumption of hateful, violent content can have on researchers. She suggested that terrorism researchers need to work closely with, and educate university ethics committees on both terrorism and Internet research. The Dublin-based counter-terrorism expert argued: “We must widen our research on social media across ideology and platform noting that most researchers have ‘dropped the ball’ to focus just on IS support/activity.” She also stressed the need to focus more on other social media platforms like Facebook, YouTube, Reddit, Tumblr etc. 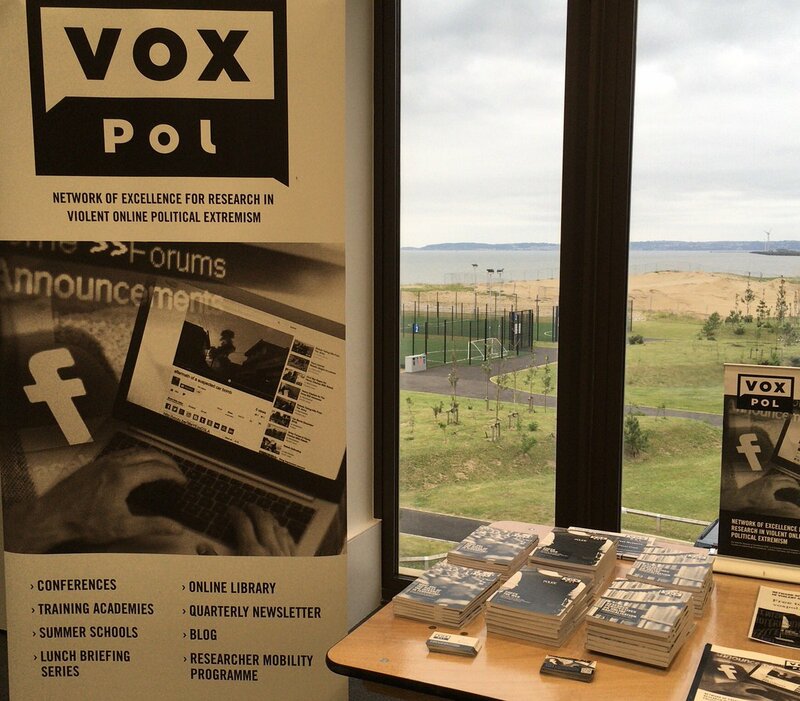 During her keynote speech, Prof. Conway showcased VOX-Pol’s online library which pertains to not just IS, but also focuses on far-right groups, other violent jihadists including al Qaeda and the Taliban, Irish Republicans, and Hezbollah. Prof. Conway emphasised that “we’re not journalists; researchers are regulated differently” and urged more attention to ethics issues by thinking and talking more; embracing the “visual turn” and not shifting our fixation from IS Twitter to IS Telegram but widening attention to cover other groups and platforms. The TASM Conference got into full-swing after the keynote speeches. Reem Ahmed, a researcher at University of Hamburg and VOX-Pol representative, presented her paper entitled “Navigating the (Extreme) Right Online: A Frame Analysis Approach,” which was based on a Twitter dataset of right-wing extremists compiled by VOX-Pol researchers. The other VOX-Pol paper in the morning session was co-presented by Ryan Scrivens of Simon Fraser University (VOX-Pol Researcher Mobility Programme participant), Dr. Lorraine Bowman-Grieve of Waterford Institute of Technology, Professor Maura Conway of Dublin City University, and Dr. Richard Frank of Simon Fraser University. The paper was entitled “Sugar, Spice and Everything Nice? Exploring the Online Roles of Women in the Far-Right Movement” in which the ladies-only section of StormFront.org website was analysed using big data methods and sentiment analysis. The study, supported by VOX-Pol, concluded that far-right women operationalised in both public spaces as well as home, focusing on raising strong White (nationalist) children by home-schooling and educating them. In one of the afternoon parallel sessions of Day 1 of the TASM Conference, VOX-Pol’s Programme Manager, presented a paper entitled “#Twitterkurds: An Analysis of Key Influencers”, co-authored by Sean Looney and Shahed Warreth (VOX-Pol researchers from Dublin City University). Given the dearth of research relating to online activities of Kurdish supporters of political violence, this was an exploratory study to understand the nature of the online discussion and dynamics surrounding online support for Kurdish political activities. Next on the same panel was Elizabeth Pearson of King’s College London who presented her paper entitled “Gender, Suspension, and Community in Islamic State’s Wilayat Twitter.” The VOX-Pol-funded research, using a dataset of more than eighty Twitter accounts, explored the gendered ways in which self-proclaiming Twitter IS supporters construct community around the act of suspension. The other VOX-Pol-funded paper presented during one of the afternoon sessions on Day 1 was entitled “Militarisation/Radicalisation – What’s in a Name?” The paper was co-authored by Prof. Maura Conway, Dr. James Fitzgerald of Dublin City University, and Dr. Nick Robinson of University of Leeds. The paper explained why the phenomenon of militarisation and radicalisation are seen so differently politically, ethically and normatively. It also compared the claims underpinning radicalisation and militarisation of social media. VOX-Pol’s Dr. Paul Gill of University College London presented his paper entitled “Are Threats Made Offline More ‘Risky’ Than Those Made Online” in which he analysed a unique dataset of over 3000 threats made to the British Royal Family through offline (e.g. via handwritten communications) and online (e.g. via email) mediums. The final VOX-Pol paper presented on Day 1 of the TASM Conference was entitled “Measuring the Impact of Disrupting Online Terrorist Material”, co-authored by Dr. Suraj Lakhani of the University of Sussex, Prof. Maura Conway and Moign Khawaja, both of Dublin City University. This paper measured the overall disruption of IS activity on Twitter. It also recommended a closer look at other violent jihadi groups, especially al Qaeda and the Taliban, on Twitter, and across other platforms. Day 2 of TASM Conference started with the keynote speech by Barrister Max Hill, an independent reviewer of terrorism legislation. In his speech, he addressed the use of social media for terrorism and explored different aspects of terrorism-related legislation, investigation and prosecution. Various speakers presented their academic papers on topics related to terrorism, social media, countering violent extremism and counter-narratives for the prevention of radicalisation during the second day of the conference. The second and final day came to conclusion with keynote speeches by Prof. Philip Bobbitt and Dr. Erin Marie Saltman. Prof. Bobbitt’s speech centred on the transformation of industrial states to modern information states whereas Dr. Saltman, representative of Facebook, explained Facebook’s policies, initiatives and vision on violent extremism and hate speech. 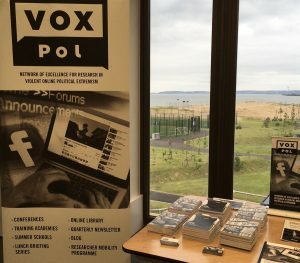 VOX-Pol’s presence at the conference was noted not just by the presence of several speakers but also an information stall where literature related to online radicalisation and other VOX-Pol reports was distributed for free. The follow-up event to the TASM conference was the “Terrorism and Social Media Sandpit” which was held on 29 June. Organised by the Cyber Terrorism Project, the event witnessed PhD researchers entering a competition where new research ideas were discussed, debated and evaluated. Prof. Maura Conway, coordinator of VOX-Pol, was an adjudicator. Organisers of the conference announced that a special issue of Studies in Conflict & Terrorism will emerge from the conference. Prof. Maura Conway will be the co-editor of the special issue, which will be published by the Taylor and Francis Group.